Gone are the days where the sheer number of followers you have is all that really matters. Instagram has become a digital business card and portfolio. When someone pops over to your profile, they don’t waste a second determining whether or not they want to follow you. So that begs the question, is your Instagram profile worthy enough for someone to follow? Today, we’re showing you how to create a killer Instagram profile that stands out and gets you noticed. First, let’s start with what exactly matters most to your followers on your Instagram profile. Choosing an Instagram username can be tough. It is the single most important aspect of a brand. A good name helps personal brands and businesses stand out and become memorable. Although you can change your username at anytime, it’s best to decide on one that you will stick with. If you ever DO decide to change it – any tags or mentions that you’ve gain with that username will be lost. Your username should be easy to spell in search. It’s best to use your personal name, or your brand name. Don’t use emojis, characters and crazy letter combinations. They may look cute, but these make it harder for people to find you! Save the emojis for your Instagram bio. On an average day, you may just throw on a pair of jeans and a t-shirt and call it good. But now imagine that you’re getting ready for a blind date. You want to look extra good right? So you pull together your sexiest outfit, spend a bit more time on your hair and cross your fingers that it goes well. Your Instagram followers are your blind date. The minute they lay eyes on your profile photo, you want to wow them. Unless you’re already a recognizable brand like Target or Nike, or have a team of people in your company, don’t use a logo. Instead, use a professional headshot. People connect with people. A face builds trust and communicates that there is a human being behind the brand. In order to be memorable, people have to recognize you. Think, does your profile photo meet this criteria? You’ve used a solid colored background for your headshot. The photo is well lit. You’re making eye contact and showing your smile. You’ve cropped in close to your face. Whatever you do, please don’t use a grainy selfie! Not only will it look completely unprofessional, but it won’t stand out. Finally, show your personality! People want to know who you are, so don’t be afraid to be yourself. There is only one YOU in this world. Be proud of that. Your profile photo is your first visual impression, now comes the talking part. What you choose to say in your bio is key to winning new followers over. Think of your bio as your welcome mat. Make sure to greet each visitor as if it is their first time meeting you. Unfortunately, your Instagram bio cannot exceed 150 characters. So make each one count. …and what they should do next. These are all super important elements that people will be looking for. If you’re a business, Instagram just rolled out business profiles which enables you to have a contact and follow button. This way if someone likes something they see in your feed and want to get a hold of you, they don’t have to jump through hoops to do so. This is the age of short attention spans. Don’t lose a potential client because they have no way of contacting you. Love em’ or hate them, they are part of the millennial generation. Use emojis to break up your bio text. In a world of business, it is unexpected. Just don’t over do it! These can be tricky. First, write your bio in your notes app on iOS or Android. Between each line, hit the return key to create a line break. Then, copy and paste onto your Instagram profile. Don’t forget, your bio can only be 150 characters long. 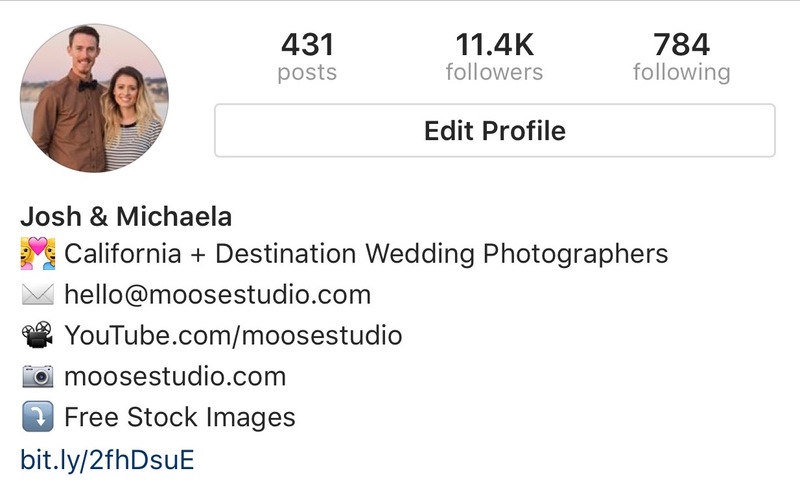 Here is an example of our Instagram profile @moosestudio and how we use line breaks. A call to action (CTA) is a phrase that encourages someone to take action. So what exactly what you want your followers to do? Read your latest blog post? Sign up for your monthly newsletter? Once you decide, give them directions on how to do that in your bio and link to it. Lastly is your url link below your bio description. This is the one place Instagram lets you place a link and it is super important to utilize this space. Therefore, tracking the url link will help you measure the effectiveness of one call to action (CTA) over another. Bit.ly is a url shortener and link management software. And even better, it’s free! For instance, say you want to link to your latest ebook for sale. Open the bit.ly website, paste your url and it will automatically shorten the link for you to track in your account. The best part about bit.ly are the analytics they provide for you to analyze. After using our tips to change your Instagram profile, share a link to it in the comments below so we can see! Building and growing an Instagram account has a lot of moving parts. If you don’t have a solid strategy to follow, it can get messy and overwhelming. That’s why we’ve created the #InstauthorityChallenge, a FREE step-by-step email course that teaches you how to build a solid foundation and grow your Instagram in just 7 days. If you want to grow your Instagram in 2017, it’s time to start planning NOW. We can’t wait to show you everything we’ve been working on. It really has been years in the making and we can barely contain our excitement! You can REGISTER here now. Oh. You just gave me some great ideas for a promotion I am running! Yes to all of this! It’s so important to have all of these on your Instagram. I’m always looking for great tips on how to grow my IG and make it look awesome. Thanks a bunch for sharing these tips, there’s a couple here that I wanna give a try! This is a lovely post! Thanks so much for the breakdown- I’m definitely going to edit my profile with this in mind! These are Amazing tips for any IGer – beginner or advanced! Thanks for sharing! Great points! I definitely think call to action is so important that a lot of the accounts on Instagram miss that. Hmm and probably I should update my profile pic. Fabulous tips! Need to add emojis and bitly my link… pronto! I’m going to agree with you, a bio is so important! Thanks for sharing, useful tips. I don’t have an instagram account for my site yet, but I plan on starting one soon. I’ll definitely be returning to this post when I do. Thanks! These are some great tips! I’m going to reevaluate my instagram! Thanks for the info. It gave me a few ideas on where I can improve my Insta bio! This post was so informative! I’m doing most things on here already, but there’s definitely a few I didn’t know about! That bit.ly trick is great, I’ve been trying to find a way to track my blog visits from Instagram! Can’t wait to dig into these and apply them! I recently got instagram a few months ago and am really trying to learn the tip & tricks, including consistent colors! Thank you for all these actionable tips! I still have to make things better at my IG abode…But I’ll get to it. Have you noticed a decrease in liked/comments after switching to a business profile ? I’ve heard a few people complain about this and it scared me off from trying it. Our account is still a personal Instagram account. Such great tips! I’m always reworking my profile to try to make it better! I stopped focusing on Instagram a little while back because I realized that while people were engaging with my account, they weren’t clicking through to my blog. Also, I find I simply can’t compete because I don’t have a fancy camera! I think that you are so right about the importance of using your face to connect more. People always talk about how people find it easier to be mean when they don’t really see you as a person. Like when I used to work at a call center and people don’t see your face. It’s the same with blogging, people feel like they know you. This was amazing! I edited mine as I read! Thank you for all the useful information. It looks much more professional now! I’ve been ignoring Instagram forever, and I really need to step up my Instagram game. These are great tips! I’m pinning so that I can follow your directions. Thanks! I recently started an Instagram and I’m both enthralled and mystified by it. I’m hopeless. Yours looks fantastic. Thanks for the pointers. Some really great tips I will have to implement. Thanks. Just starting out on instagram and this is very helpful! This was super informative!! I loved it! I went and changed up my bio right away! Thanks for the help! I’ve shared this my fellow bloggers! These are such great tips! Will try these now! I keep putting off an Instagram acct but I’m keeping this tips handy for when I finally stop procrastinating! Thanks for these! Awesome suggestions! I think I’m going to work on my Bio later this evening! I like your tip about doing it in my memo app first. Duh! Makes sense! Thanks for posting this! Wow, this is good. I need to review my profile and could use these tips. Love this fantastic advice! I need to step my IG game up a little, so I’ll be going over my profile soon! Thank you for sharing! Great tips, thanks! I love how you’ve done your bio in short, single lines with emojiis! Thanks for the tips! awesome tips…i need to pick one photo for all my accounts!! didn’t realize that could affect the amount of people that recognize me….nice post!! Great tips! Instagram is such a beast to master. lol Definitely need to check out your course. These are great tips! I’m going to start using bit.ly! The tips are awesome – Instagram can be so tricky! just revamped my bio! it looks so much better already! Updated our business account and looking forward to tracking how this helps! We love the idea of having a personal photo – but because its a “family business” we left a logo. What do you think? I think in that case it might work to leave the logo. Be sure to share the occasional photo of your family to remind customers who is behind your brand. Then you can build trust with them! My website is under construction right now. When its finished, should I link that site in leu of my Etsy? It’s not an eCommerce site, but it will have all of my products with links to the Etsy store. There’s just more design freedom on my own website so I’d like to drive potential clients there because I think the products can be displayed a little better. I also will showcase a blog as well. What do you think? https://www.instagram.com/aliciaknebel/ thank you for your great tips ! Thanks for all the tips, this really helps! Working on re-focusing on our toy company’s social media sites. Would love some feedback on our profile! Thank you for the tips! I tried it – what do you think?